The Signal generator is a robust instrument and can withstand prolonged short circuit for the output. 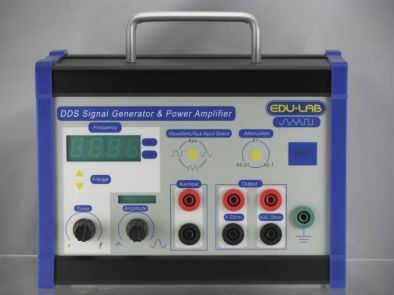 The earth provided is connected to the physical earth through the power cord; the signal generator output is floating with respect to ground. Do not open the unit as this will make your warranty void. Frequency Range: 0.1 Hz to 99.9 KHz in six decades, read on digital display. Maximum Power output of 4.5W available over the entire frequency range for all waveforms. Attenuation: x1, x 0.1, x0.01, ±1%, operating only on the 600ñ output. Controls : All control settings except amplitude are stored and updated upon any changes.